The ultimate fitness vacation is not a spa retreat in which you wander around in your robe all day ommming and ahhhing. The ultimate fitness vacation provides you with an action-packed daily schedule which includes cardio, power yoga, hot yoga, strength training, swimming, hiking, and visualization taught by some of the best fitness instructors in California. The ultimate fitness vacation is hosted in the breathtaking mountains of Lake Tahoe. Join Ultimate Fitness Vacation for laughter, fitness, gourmet food, and if you want to wander around in your robe, that's okay too. 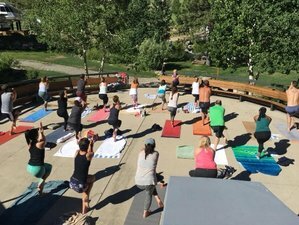 Please note that all daily group classes including yoga, Pilates, cardio, guided hikes, mountain biking, and SUP are included in the cost of the program, however, equipment rental for mountain bikes, stand up paddle boards, and massage are not included. Kathryn Keown has been a yoga and fitness instructor for more than 18 years. She has been a Leukemia Lymphoma Society 'Woman of the Year' Nominee for using yoga to raise funds for research and support for the LLS. She has also used yoga to raise funds to send children with life-threatening illnesses to pediatric oncology camps such as Camp Okizu, The Periwinkle Foundation and Camp Good Times. Kathryn has been an advertising executive for more than 20 years working for Cumulus Media, the parent company of KNBR, KFOG, and KSAN. Kathryn lives with her family in Marin, California. Meals are a combination of vegetarian dishes, fish, and chicken. Friday night dinner is on your own so you can enjoy the charming restaurants at the village at Squaw. Please book your flight to arrive at Reno Tahoe International Airport (RNO). Village at Squaw is about an hour from the Reno Tahoe International Airport. It is a spectacular drive. Guests may pay for a shuttle through the North Lake Tahoe Express. The Ultimate Fitness Vacation is not your average 'spa retreat' in which you wander around wearing a robe that god knows how many people have worn.